MOOCs—or Massive Open Online Courses—have been getting a lot of attention lately. Just in the last year or so there’s been immense interest in the potential for large scale online learning, with significant investments being made in companies (Coursera, Udacity, Udemy), similar non-profit initiatives (edX), and learning management systems (Canvas, Blackboard). The renewed interest in MOOCs was ignited after last year’s Introduction to Artificial Intelligence course offered via Stanford University, when over 160,000 people signed up to take the free online course. The idea of large-scale, free online education has been around for quite some time. Some examples include David Wiley’s 2007 Introduction to Open Education; Connectivism and Connective Knowledge, led by George Siemens and Stephen Downes in 2008; Open Content Licensing for Educators; and many others. The original MOOCs…were "open" in two respects. First, they were open enrollment to students outside the hosting university. That is open as in "open registration." Second, the materials of the course were licensed using Creative Commons licenses so their materials could be remixed and reused by others. That is open as in "open license." These dual characteristics of "open" are also core to Open Educational Resources (OER). Hewlett’s updated OER definition begins: "OER are teaching, learning, and research resources that reside in the public domain or have been released under an intellectual property license that permits their free use and re-purposing by others." That is, for an educational resource to be "open" it must be both gratis (available at no-cost) and libre (everyone has the legal rights to repurpose the resource). An OER cannot be freely available or openly licensed—it must be both freely available and openly licensed (or in the public domain) to be an OER. The new cohort of MOOCs are distinct from the original MOOCs in that they are "open," thus far, in only one respect: they are open enrollment. The new MOOCs have not yet openly licensed their courses. As MOOCs continue to develop course content and experiment with various business models, we think it's crucial that they consider adopting open licenses as a default on their digital education offerings. In general, the value proposition can be enhanced for the new MOOCs and their users if the MOOCs openly license their courses. Commercially-focused MOOCs can adopt CC licenses to make their MOOCs truly "open" (free of cost and free of most copyright restrictions) and still leverage the scale of these courses (with potentially tens of thousands of students) and the MOOC platform to charge for value-added services, such as the coordination of study groups, course certification, secure assessments, employee recruiting, and print-on-demand textbooks. MOOCs can provide features their users want by incorporating open licensing options. Recently, the education technology company Blackboard has permitted users to upload educational content under the Creative Commons Attribution license. Since many MOOCs want to support individuals who want to share their creations as well as open collaboration between course participants, it may be worthwhile for the MOOCs to support users with this easy-to-implement feature. By supporting open licensing, MOOCs will be positively contributing to the Open Educational Resources movement, reaffirmed in the 2012 Paris OER Declaration. 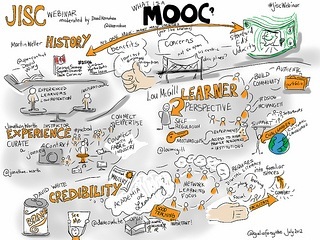 MOOCs can be leaders and innovators for OER, increase their enrollment numbers, and receive the goodwill that comes along with being an active participant in this global open education movement. Online education knows no language barriers, and a large percentage of MOOC participants are logging on from outside of North America (where most of the new initiatives are based). For example, in a recent MIT MOOC course with 155,000 registrations, students came from 160 countries (PDF). If MOOCs want to continue to attract and serve an international audience, they might focus on multilingual course delivery. It should be noted that MOOCs that release course content under Creative Commons licenses (at least the licenses that do not contain the “NoDerivatives” condition) automatically grant permission for users to make translations of the materials. MIT Open CourseWare courses have been translated into at least 10 languages, including Spanish, Portuguese, Chinese, Thai, French, German, Vietnamese, and Ukrainian. Coursera and Udacity have already partnered with the crowdsourced captioning service Amara. Openly licensed MOOC resources can give rise to interesting new courses and educational products and services. For instance, materials released under a license like CC BY can be repurposed and reused on sites like Wikipedia and hundreds of Open CourseWare projects. Adopting CC licensing can support the conditions necessary for innovation that is difficult to predict (or plan for). In the long run, supporting the open ecosystem is beneficial both for commercial and non-profit MOOC initiatives. In addition, many educators and learners want to be able to use the resources outside of the MOOC environment, and open licensing grants this permission in advance. CC licensing opens up a much broader range of pedagogical approaches that enable all MOOC participants, instructors and students alike the ability to generate, use, and share content with each other. Many MOOCs are concerned that their content will be "stolen" by competitors. However, this fear is speculative. There are features of the CC licenses that can help assuage the fears of MOOCs. For example, all the CC licenses provide for attribution to the original author, preservation of any copyright notice, and the URL to the original work. When MOOC material are licensed under a CC license permitting the creation of adaptations, the adapted resources must be clearly marked to indicate that changes have been made, and a credit—reasonable to the means and medium being used—that the MOOC material has been used in the adaptation. Also, CC licenses do not grant permission to use anyone’s trademarks or official insignia, nor do the licenses affect other laws that may be used to protect one’s reputation or other rights—those rights are all reserved and may be enforced separately by the MOOC. Finally, it should be noted that the original educational materials remain intact and preserved, exactly as released (most typically) on the MOOC website. So, there will be a record of the original publishing of the content. But beyond these features of the CC license, community and business norms make it very unlikely that competitor MOOCs will “swoop in” and republish full courses simply because the open license technically makes this a possibility. Norms of academic practice typically carry more weight than any legal restriction made possible through use of an open license. MOOCs should address copyright and licensing early on so they are clear to users how they can utilize and reuse educational materials offered on the site. MOOCs should choose to adopt an open license that meets their goals, but at minimum it is recommended that they choose a public, standardized license that grants to its users the “4Rs” of open content: the ability to Reuse, Revise, Remix, and Redistribute the resources. The more permissions MOOCs can offer on their content, the better. Online peer learning community P2PU has provided some useful documentation about how to choose a license. And CC maintains easy-to-understand information about how to properly implement the CC license on websites and platforms. Of course, it is important for MOOCs and users of MOOCs to understand some of the copyright and intellectual property considerations that they should know about before they adopt an open license for educational content. MOOCs have captured the public mindshare as an interesting way to deliver high quality education to huge numbers of online learners. In order to maximize the educational benefits that MOOCs promise to provide, they must be "open" in both enrollment and licensing. MOOCs should seriously consider applying CC licenses to content they build, asking contributing Universities to openly licnese their courses, and making CC licensing part of their MOOC platforms. By doing so, they’ll be best positioned to serve a diverse set of users and support the flourishing open education movement. Originally posted on the Creative Commons blog. Reposted under Creative Commons. We also want to remind you that all our content is licensed under Creative Commons Attribution-NonCommercial-NoDerivs 3.0 License. MOOCs, without M and O only OC Online Courses exist in the USA for 20 years not massive 100-200 person per course or per college at $ 1,500 fee per course for credits . Therefore mainly by for profit companies . , but no credits and degrees yet . Misuse of online technology by commercial companies caused the development of online , and as a result HE in the USA. ONLINE was a dirty name for 20 years now it is good by elite universities . That is good . I hıope we will close the gap soon . I expect MOOCs to provide credits and degrees soon .